Norway was ruled by Denmark from 1397 to 1814, when it passed to Sweden. Although Norway separated from Sweden in 1905, its current flag today is still reminiscent of the one-time union. Before it was united with Sweden, until 1814, the Norwegian flag bore an off-center white cross on a red background. In 1821, during the time Norway was united with Sweden, the blue cross of Sweden was added. The flag that resulted — an off-center blue cross within an off-center white cross on a red background — is still the current flag of Norway. The three colors — red, blue, and white — were chosen to honor the French tricolor, which represents liberty, equality, and fraternity. The colors were also chosen to honor both the United States and the United Kingdom, two countries with democratic governments. The country of Norway is located in the western part of Scandinavia, and it is populated by 4.5 million people. The language spoken is Norwegian, and the currency is the Norwegian krone. One of the things that makes Norway unique is its diverse landscape. Known for four beautiful seasons, Norway is home to mountains, plateaus, and fjords that were formed as a result of receding glaciers. While Norway boasts the highest average temperature in Scandinavia, its capital, Oslo, is also known for some of the chilliest weather in the region. As a matter of fact, wintertime temperatures in Oslo can fall as low as -13° F.
Most of the residents of Norway are Norwegian, although the population of immigrants is growing, in particular due to the war in Bosnia. While Norway's high cost of living means that living in Norway is more expensive than it is in some other European countries, a constitutional requirement ensures that all residents are given every opportunity to find suitable work. Compared to the rest of Europe, Norway has a relatively stable inflation rate and a low unemployment rate. The nuclear family is highly respected in Norway, with both men and women sharing the responsibility for raising a family and running a household. As evidenced by the fact that they hold 40 percent of the seats in government, women enjoy significant freedom and power. Gro Harlem Brundtland was Norway's first female prime minister, and later went on to head up the UN. 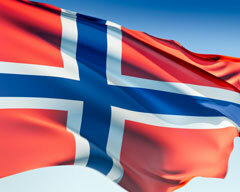 Norway is a founder member of NATO, joined the UN in 1945, and is a key player in the European Union. Norway is known for its role as a mediator in many worldwide conflicts, most recently in the Israeli- Palestinian conflict and also in Sri Lanka. Norway gives a significant portion of aid to other countries every year, including southeast Africa, south Asia, the Balkans, and Kosovo. When it comes to economics, Norway is one of western Europe's largest producers and exporters or oil and natural gas, and also produces and exports a significant amount of mineral reserves. The fact that most of the country's energy needs are taken care of by hydroelectric power means that they can export most of the oil they produce. Fish and forestry — salmon farming in particular — also contribute to Norway's economy. While shortages of skilled labor have always been an issue for Norway, this burden has recently been eased somewhat as a result of immigration from other Scandinavian countries. Norway is a popular tourist spot; it attracts visitors from the United States, UK, Germany, Denmark, Sweden, as well as other countries throughout Europe. Skiing is the mainstay of the winter tourism season, drawing many visitors per year, particularly to Lillehammer, where the 1994 Olympics were held. Summer visitors enjoy cruising along the fjords, especially in the Arctic Circle where the midnight sun can be viewed. Visitors also come to enjoy the musical heritage that Norway is known for. 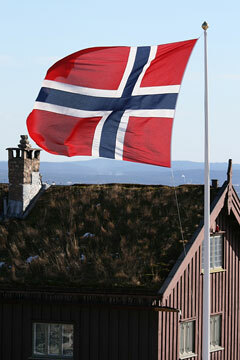 Norway Facts - information about Norway and its flag. Norway - official Norwegian embassy website for the USA. Government of Norway - official Norwegian government website. Norway Maps - maps of Norway and Oslo, Norway's capital city.